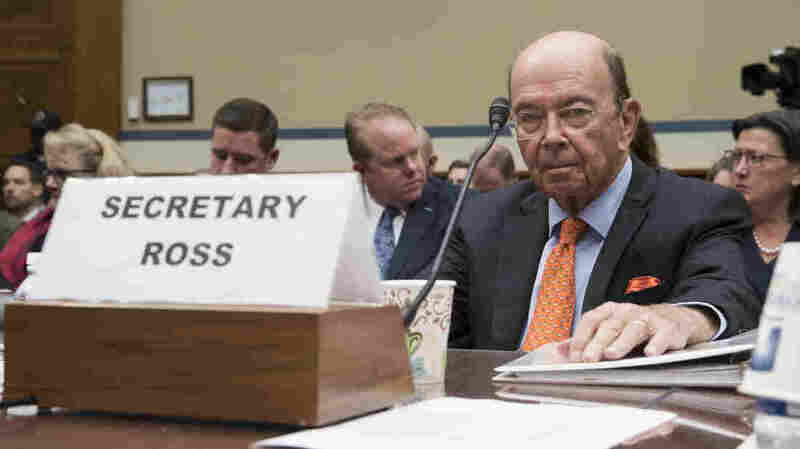 Lawsuit Documents Shed Light On Decision To Add 2020 Census Citizenship Question Emails and memos show Commerce Secretary Wilbur Ross overruled Census Bureau concerns and was urged to exclude noncitizens from census numbers used to reallocate congressional seats. Commerce Secretary Wilbur Ross, who oversees the Census Bureau, appears before the House Committee on Oversight and Government Reform to discuss the 2020 census, in Washington, D.C., in October 2017. Ross has said the driving force is the need for more accurate citizenship data, which he wants to collect during the next once-a-decade head count of every person in the country as required by the U.S. Constitution. The question was requested this past December by the Justice Department, which says it needs data from the census to better enforce the Voting Rights Act's provisions against racial discrimination. Since the law was enacted in 1965, the federal government has relied on estimates of the citizen population based on Census Bureau surveys involving a sample of U.S. households. But critics of the new citizenship question — including more than two dozen states and cities who are taking the Trump administration to court to remove it — say they are skeptical of the Justice Department's reasoning. They're concerned that a question about citizenship status — a topic that the Census Bureau has not asked all households since 1950 — will discourage noncitizens from participating in the census, especially given the increased immigration enforcement and rise of anti-immigrant rhetoric under President Trump. On June 8, the Commerce Department released 1,320 pages of internal memos, emails and other documents related to Ross's decision as part of the lawsuits against the citizenship question. They provide some new insight into the behind-the-scenes discussions leading up to the commerce secretary's controversial announcement in March — one that could have ripple effects on the 2020 census results that will be used to reallocate congressional seats, draw legislative districts and distribute an estimated $800 billion a year in federal funds. In a Jan. 19 internal memo prepared for Ross, the Census Bureau's chief scientist, John Abowd, wrote that adding a citizenship question to the 2020 census "is very costly, harms the quality of the census count, and would use substantially less accurate citizenship status data than are available" from existing government records at other federal agencies. Ross has said that he believes the cost of this last-minute change to the 2020 census would not be significant and has been factored into updated cost estimates. Still, Abowd projected that it would raise the price tag for the national head count by at least $27.5 million, which he described as a "conservative estimate" given the possible need for more door-knocking and other follow-up efforts to get noncitizen households to take part in the census. In a July 2017 email to Ross's chief of staff, Wendy Teramoto, Kansas Secretary of State Kris Kobach says Steve Bannon — the former White House strategist — directed Kobach to speak on the phone with Ross in 2017 during the early months of the Trump administration about the then lack of a citizenship question on the census. Kobach had once helped lead Trump's now-dissolved voter fraud commission. Neither Kobach nor Bannon have responded to NPR's requests for comment about this email. A Commerce Department spokesperson would not provide any details about the phone call between Kobach and Ross. "The Kobach email is one out of over 500 pages of stakeholder records produced in the administrative record," the spokesperson wrote in an email. "The notion that Secretary Ross decided to reinstate the citizenship question in response to a single email is clearly disproved by the robust administrative record." Still, after this communication was revealed, attorneys for plaintiffs in some of the citizenship question lawsuits filed a motion in San Francisco federal court to request that Kobach and Bannon testify out of court. Kobach told Ross including "aliens" in census numbers for congressional reapportionment is a "problem"
In another July 2017 email, Kobach wrote to Ross that he was concerned that "aliens who do not actually 'reside' in the United States are still counted" in census numbers used to determine how many congressional seats each state gets. Before Ross decided to add a citizenship question to the 2020 census, the Census Bureau's acting director, Ron Jarmin, and other officials tried to convince him to meet the Justice Department's needs by using existing government records about U.S. citizens. Ross ultimately decided to allow the bureau to request access to federal data sets to supplement the 2020 census responses to the new citizenship question. A draft internal Census Bureau document shows that the statistical agency has been working to get access to naturalization data from U.S. Citizenship and Immigration Services, visa and passport data from the State Department, and records from the Social Security Administration. A spokesperson for the Commerce Department, which oversees the Census Bureau, says the information detailed in the document is up-to-date. A spokesperson for the Social Security Administration, Darren Lutz, confirmed that the agency is "currently working with the Census Bureau to renew" a data-sharing agreement that expires at the end of September. Spokespeople for USCIS and the State Department said they could not address NPR's questions about the bureau's data requests by publication time.